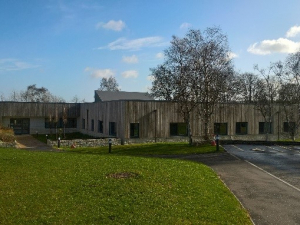 Under the HFS Framework Scotland 2 we undertook the design of a highly specialised 1200 sqm, £4.4m Intensive Psychiatric Care Unit for NHS Fife at Stratheden Hospital in Cupar. The energy-efficient IPCU is for those experiencing acute episodes of mental illness, providing specialist care and treatment to patients. Facilities include eight en-suite single bedrooms, space for therapeutic and rehabilitative activities, communal lounge and dining accommodation, visiting and staff areas, consulting and meeting rooms as well as secure external grounds, additional features were installed for patient and staff security, using bio-dynamic lighting, nurse call systems, access control and CCTV.